Get kitchen cleaning services in Delhi with a 30 Day Service Guarantee and Protection against Damage upto INR 10,000. We provide services like Deep Cleaning, Sanitization, Vacuuming, and our 4+ rated experts use well mechanised equipments to clean your kitchen. Our trained & verified experts promise on time delivery as per your convenience. Not getting your kitchen deep cleaned regularly can lead to various health problems. All UrbanClap Cleaning experts use eco-friendly and chemical-free products. Just book one on UrbanClap and get the best kitchen cleaners in Delhi. Good service and very polite and courteous staff. sarahhired Limelight Facility (OPC) Pvt. Ltd.
priti singhhired Limelight Facility (OPC) Pvt. Ltd. Awesome service by the staff.. I m Fully satisfied with the kind of work done.. thanks urban clap and team. I received Kitchen deep cleaning services and they have done a fantastic job today. They cleaned it very thoroughly and fantastically. Thanks again for the service. Both the people that have come for cleaning my kitchen were on time. Have done their work neatly even without supervision. Finished the work on time . The staff did thorough job but were very late and slow... The job which was supposed to start at 10, started at 11:30 and it took 6 hours to complete the entire job neatly... wish it was a bit faster! Such professional group. They did their with all their heart. Will definitely recommend. Thank u. Cooking in the kitchen produces grease, moisture and smoke. There are food crumbs, food items and trash in the bin that can attract pests of various kinds if you do not clean your kitchen and throw out the trash regularly. Your kitchen also needs deep cleaning regularly so that every hidden corner is cleaned and sanitized and does not act as a breeding ground for germs. It is, therefore, recommended to hire professionals for kitchen cleaning in Delhi periodically. From windows, ventilators and gas knobs to exhaust fans, kitchen tiles and switchboards, everything is cleaned thoroughly. The cleaning professionals remove oil stains from tiles, appliances, etc. and clean stainless steel/chrome fittings in the kitchen. They also scrub and disinfect the floors in addition to cleaning the kitchen cabinets. Improves Working Conditions:Professional kitchen deep cleaning provides a healthier working environment for you and helps you maintain food hygiene more efficiently. Increased Hygiene: A deep clean can prevent cross-contamination and spreading of bacteria. This means that kitchen deep cleaning will increase the level of hygiene throughout your kitchen. Reduces Food Borne Diseases: It is important to have your kitchen deep cleaned on a regular basis as part of your food health and safety procedures because it can stop germs from infecting your food and utensils. Keeps Your Environment Healthy: One of the benefits of booking kitchen cleaning services in Delhi is that it has a positive effect on your health. Grease and high moisture levels in the kitchen ducts can lead to the growth of mould, mildew and bacteria. Over time, your whole house may become infested with disease-causing germs making you and your family more prone to illness. 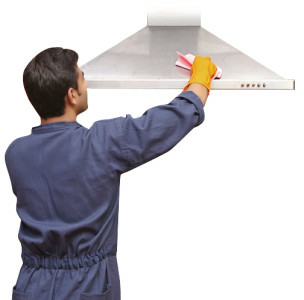 Therefore, it is ideal to hire a kitchen cleaning professional to keep your kitchen hood and ventilators clean. When should you book a Kitchen Deep Cleaning service? Every month, to keep your kitchen clean and sanitized. Well-trained & Verified Cleaners: All UrbanClap professionals are trained and are taken through levels of quality checks before getting on board with us, to ensure the quality of work. Complete sanitization: While providing you with the quality service, we never let your hygiene suffer at any point – with the use of kitchen cleaning tools and Professional grade chemicals. Customer Protection against damage:With UrbanClap you get customer protection of up to Rs. 10,000 against any damage on each booking. Flexibility:UrbanClap provides you a comprehensive kitchen deep cleaning service at your doorstep to meet all your cleaning needs at your chosen place and time. Professional grade Diversey chemicals and cleaning equipment like wipers, scotch brite scrubbers, cleaning agents and disinfectants. Know someone in Dubai who cannot cook in a messy kitchen? Just book our Kitchen cleaning services in Dubai and let them relax.